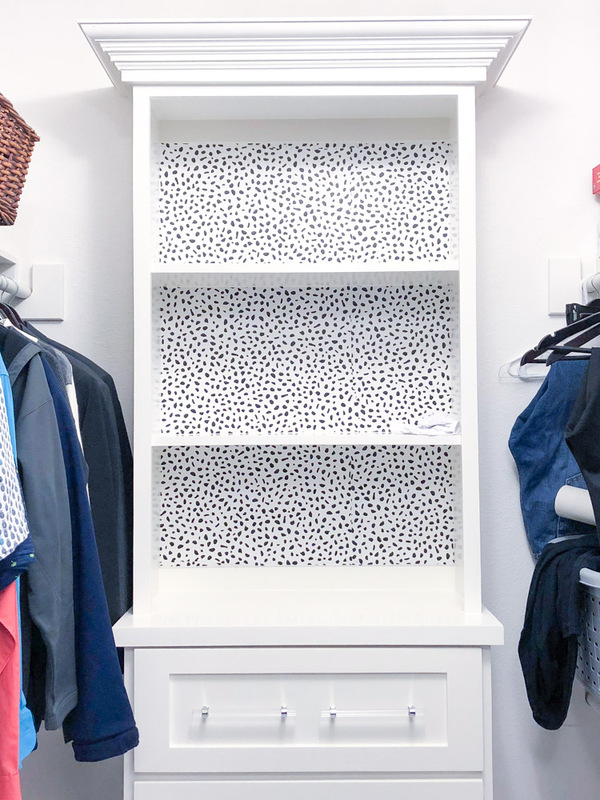 It’s week 2 of the $100 Room Challenge where I’m revamping our boring master closet for only $100 in under 4 weeks! This means we’re halfway…which is kind of nuts. 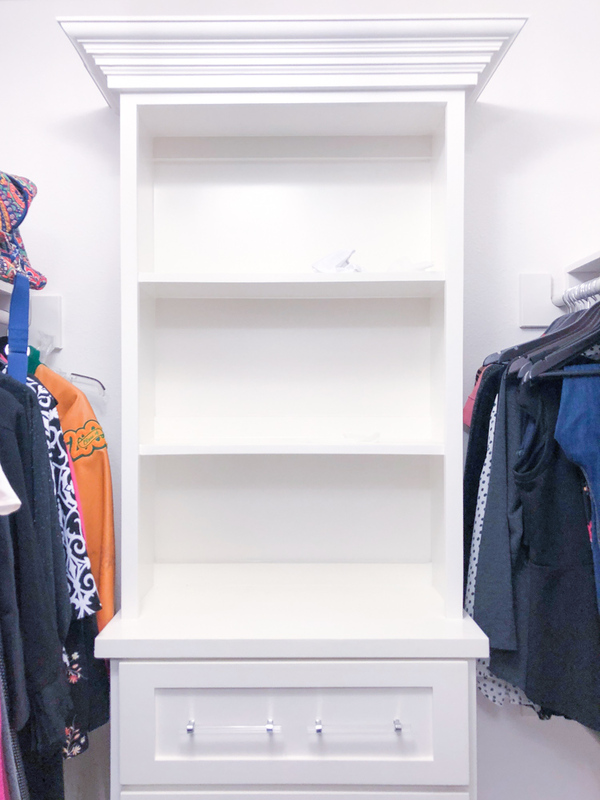 I know that four weeks flies by, so I’ve made what feels like a crazy amount of progress in the master bedroom closet because the biggest project is now complete. You can catch up on all the details in my week one post. The major accomplishment this week was getting the built-ins and shelves wallpapered. Let’s check out how it looks now and how we got here. 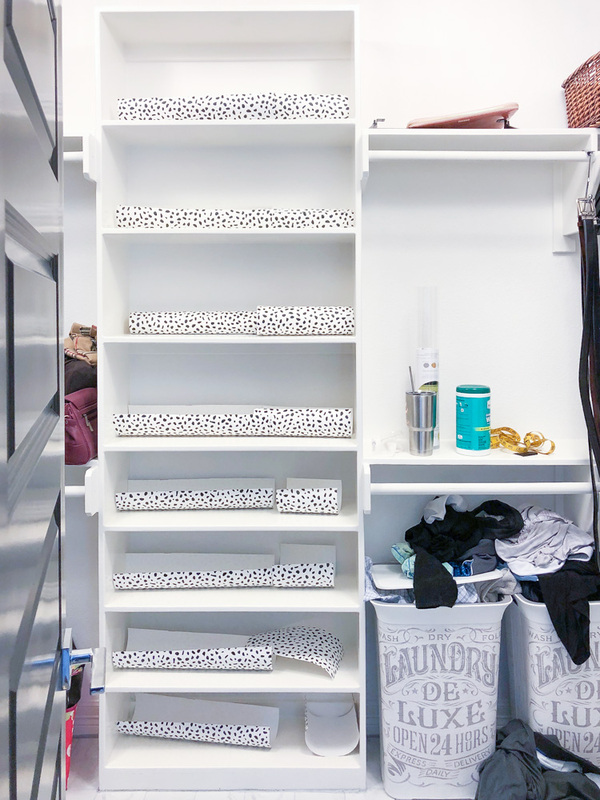 While I had enough of the speckled black and white temporary wallpaper to do the built-ins on my side and my hubby’s, that did mean I had to spend $30 to get another roll of the wallpaper to do the big set of built-ins/shoe rack in the center of the closet. That was $30 I was so not planning on spending. Ouch. BUT I do think it was worth using up 30% of the $100 budget. This project was fairly straight forward, but it was a hair time consuming. Luckily, I had a ton of energy this weekend and I knocked it out. Here’s some crappy iPhone pics showing the before and after. As you can see, I didn’t worry about lining up the pattern- it’s so busy, you can’t tell once you put stuff on the shelves. I essentially measured each shelf to get the width and height using a cloth measuring tape (just easier to me than a traditional tape measure in this case), added about a 0.5 inch overall to have some wiggle room, trimmed down to size, and cut away the excess using a sharp blade once it was adhered. I did use a Lysol wipe on the surface before putting the wallpaper down to ensure there was no dust. 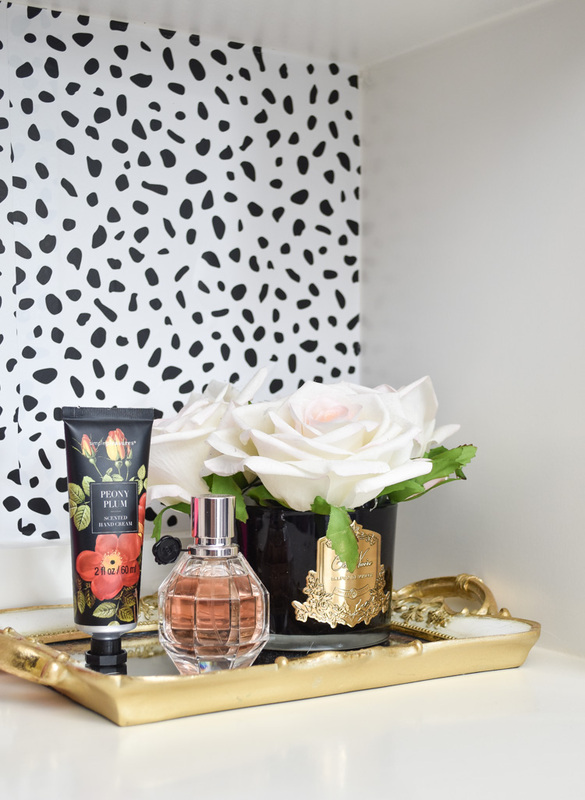 I’m using the bottom shelf on my side to hold jewelry and perfume to help get rid of some of my bathroom counter and nightstand clutter. Hopefully this will FINALLY get me to stop leaving my earrings all over the place. 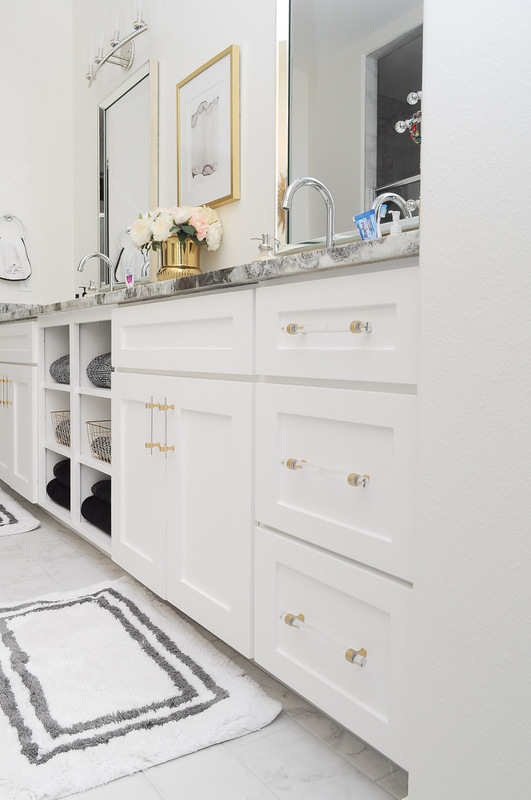 The drawer pulls will get the spray paint treatment—I love the lucite, but I love it even more with the gold (as seen in my master bathroom). I wrote a full tutorial on how to change your pulls from chrome to satin gold over here. This coming weekend I’ll work on reupholstering the ottoman and spray painting the legs. I am pretty fearless when it comes to DIY, but I truly have trouble creating neat corners when reupholstering something. Ends up looking like the staple gun and I had a war and many staples were lost. And finally, I am on the prowl for a cute, neutral rug that is 3’x5′ and under $30 shipped! No pressure, right? If you have any suggestions, let me know in the comments, k? xo. Let’s take a look at the to-do list for this challenge and make sure Monica is on budget! 8.) And a miscellaneous supplies contingency of $20. I think that wallpaper is perfect for the shelves! 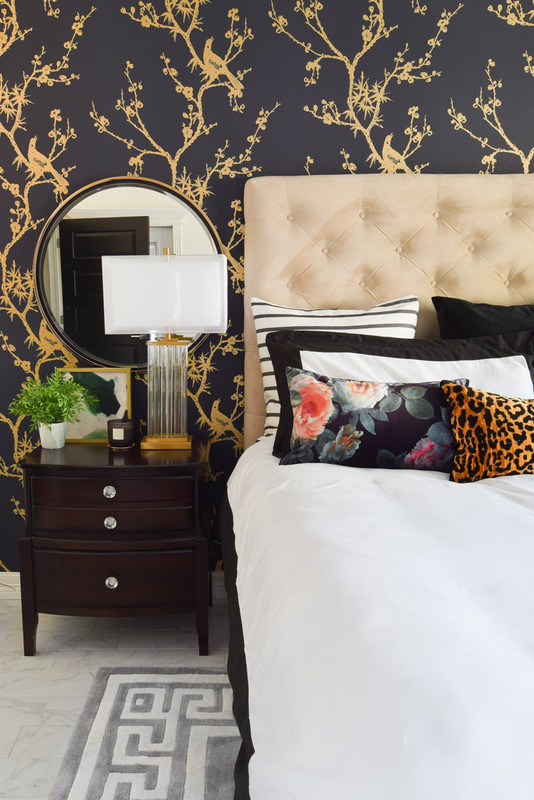 I always love the colors that you use in your room makeovers and I can't wait to see more. Omg! I'm loving this so much! What a difference it makes! Halfway there! 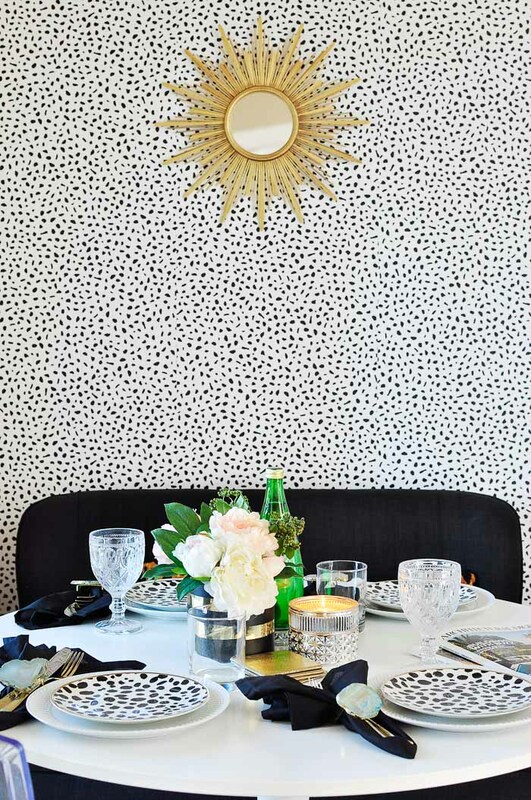 The Wallpaper looks great Monica! I love that you are sorrynotsorry about your shoes. I have TONS of heels, that I am never wearing again, not sure that they are worth keeping just for display…Or are they? Such a fun print and color combination! That wallpaper makes a huge difference. Can't wait to see it all finished. Loving the progress! Lining the backs of shelves always makes what's on them pop! Looking wonderful! 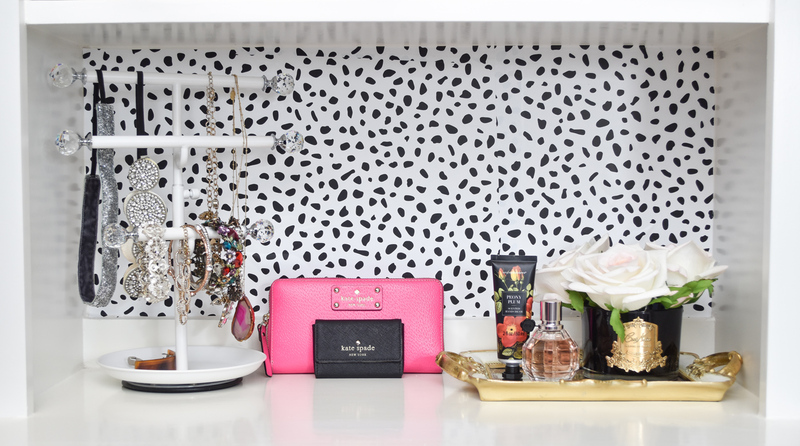 Love the dalmation wallpaper so much, perfect for the closet. Can't wait to see more. It reminds me of the closet in your former home- I LOVED that closet DIY of yours. I love that wallpaper!! How fun would it be to put together an outfit in this gorgeous space! !